Pediatric oncologist Kevin Curran with leukemia patient Esmeralda Pineda. Ezzy participated in a clinical trial of CAR T cells at MSK and is now cancer free. A novel form of immunotherapy called CAR T is now an FDA-approved option for people with acute lymphoblastic leukemia (ALL) that has stopped responding to chemotherapy. Our scientists played several key roles in CAR T cell therapy development. In what is being hailed as a watershed moment for both cancer care and biotechnology, the US Food and Drug Administration has approved a personalized, cell-based immunotherapy for use in children and young adults with blood cancer. The treatment is a type of immunotherapy called chimeric antigen receptor (CAR) T cell therapy. In this approach, scientists genetically engineer a patient’s own immune cells to make a new protein that can latch onto cancer. This turns them into supercharged cancer fighters. Such CAR T cells have shown great promise in beating back blood cancers, such as several types of leukemia and lymphoma, that have stopped responding to other therapies. Memorial Sloan Kettering scientists played a pivotal role in developing the science and technology on which the newly approved treatment is based. With this FDA approval, children and young adults up to age 25 with relapsed or refractory acute lymphoblastic leukemia will be eligible to receive the therapy. It was previously available only to patients participating in clinical trials. 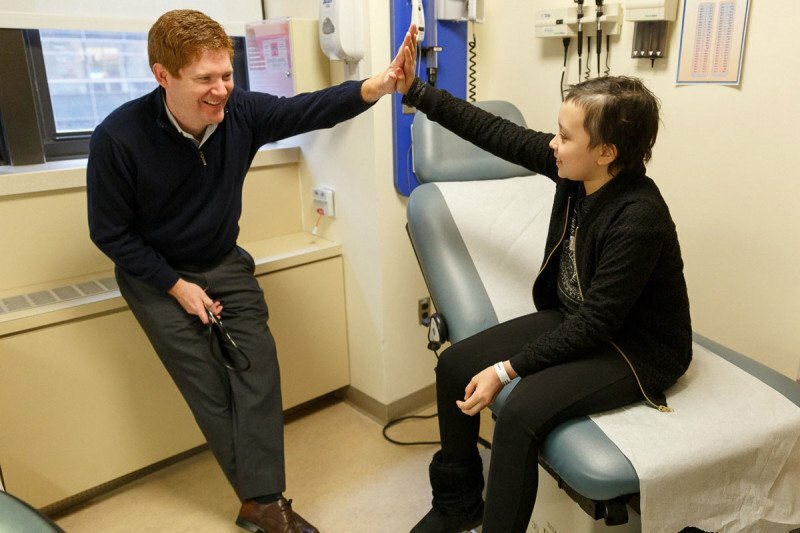 Pediatric oncologist Kevin Curran, a member of the Pediatric Bone Marrow Transplant Service and the Cellular Therapeutics Center who leads MSK’s CAR T cell efforts in children and young adults, called the treatment “revolutionary” and said it opens a whole new avenue of options for patients. With CAR T cells, we're harnessing the immune system to specifically target leukemia. The drug, called tisagenlecleucel (brand name Kymriah), is manufactured by the pharmaceutical company Novartis. While CAR T cells represent a leading edge of medicine, the science they are based on is not actually new. The intellectual roots of CAR T therapy go back nearly three decades to the postdoctoral research of a young scientist named Michel Sadelain, now the Director of the Center for Cell Engineering at MSK. At that time, in the early 1990s, the techniques to introduce genes into cells were just being developed. Dr. Sadelain saw potential in the new approaches to engineer immune cells with new attributes — giving them souped-up capabilities. A chimeric antigen receptor, or CAR, joins together part of an antibody and part of a T cell receptor. Dr. Sadelain brushed off the skepticism. In 1992, he published his first abstract on T cell engineering. A decade later, in 2002, he and his MSK colleagues published a now seminal paper showing that human T cells engineered with a chimeric antigen receptor could kill tumor cells and persist in the body. They could become, in other words, a living drug. In Greek mythology, a chimera is a creature that fuses together the head of one animal with the body of another. Similarly, a chimeric antigen receptor, or CAR, joins together part of an antibody with part of a T cell receptor. Second-generation CARs, which MSK scientists pioneered, incorporate a co-stimulatory region that is key to their effectiveness. A turning point came in 2013, with the recognition of cancer immunotherapy as the “Breakthrough of the Year” by Science magazine. The piece highlighted work in CAR T therapy along with another type of immunotherapy, called checkpoint blockade, as transformative approaches to cancer treatment. The following year, the FDA granted CAR T cells a Breakthrough Therapy designation for relapsed or refractory acute lymphoblastic leukemia. The CAR T cells that have now received FDA approval target a molecule on white blood cells called CD19. This choice of target too goes back to work that Dr. Sadelain did, along with his MSK colleagues Isabelle Rivière and Renier Brentjens. He says they initially considered other targets, but CD19 had attributes that made it particularly compelling. It is expressed abundantly on the cells found in B cell leukemias and it’s located on the cells’ surface, accessible to an antibody-based hook. Once the team published their work in 2003, several other groups followed suit in making CARs that targeted CD19. To this day, CD19-directed CARs are the ones that work best, and it’s not clear that a different target would have been nearly as effective. “You can make a compelling case that the CAR T field would not exist as it does today without CD19,” Dr. Sadelain says. You can make a compelling case that the CAR T field would not exist as it does today without CD19. CARs have had the most success in treating blood cancers like leukemia and lymphoma. Whether CAR T cells will one day be able to vanquish solid tumors as effectively as they destroy blood cancers is a nagging question facing the field. Some worry that CD19 may be unique as a target, and that the approach might not work for other cancers. But Dr. Sadelain is unfazed by that pessimism. He thinks CARs will find broad uses in medicine — not only in fighting solid tumors but also in treating refractory infectious diseases and autoimmune diseases. For more about CAR T science and what MSK is doing to advance this important field, visit our CAR T page. My 5 year old granddaughter is fighting high risk pre B ALL now. Currently in Delayed intensification at Vanderbilt and doing well. So glad new therapies are in the works. Thanks for all you do for our little warriors!! Dear Elizabeth, we’re sorry to hear about your granddaughter’s diagnosis, but are glad to hear she’s doing well. Thank you for your comment, and best wishes to you and your family. My 8 year old son diagnosed 2/2016 with DSRCT. Had the MSKCC chemo protocol in Atlanta and all surgeries, radiation and clinical trial at MSKCC. HE is currently NED, has low dose (at home) chemo a week out of every month with scans every 3 months. Would he be a candidate for this wonderful breakthrough treatment? Thank you, MSKCC for all you have done for my son. Dear Carrie, we’re very sorry to hear about your son’s diagnosis, but very glad to hear that he is currently NED. The CAR T cell therapy described in this article is currently approved only for certain leukemias, not for solid tumors like desmoplastic small round cell tumor. Thank you for your comment, and best wishes to you and your family. My husband is under treatment at Sloan for Pancreatic cancer. Presently his chemo regimen is the Gemcitabine/Abraxane protocol. He is on his 2nd week of treatment. It is beginning to take a toll on his body and spirit. Has there been any studies done with CAR -T for Pancreatic Cancer? Is there a possibility of entering into a Clinical trial that may have already been started? Thank you. Dear Judith, we’re sorry to hear about your husband’s diagnosis. MSK does not currently have any CAR T trials for pancreatic cancer, but we do have a number of other trials for pancreatic cancer. You and your husband can discuss this with his MSK team. Thank you for your comment, and best wishes to you and your family. Is Keytruda one of the other trials for pancreatic cancer that you mention? Is there with this that is joinable at this time? Dear Judith, Keytruda is now FDA approved for people who have a genetic alteration called microsatellite instability or DNA mismatch repair. If your husband has these mutations, he does not need to be part of a clinical trial to receive this drug. MSK has clinical trials investigating a number of other immunotherapy drugs in pancreatic cancer. Thank you for your comment. Car T therapy has been recommended for my brother... We live in Pennsylvania. How do I find out what hospitals do this therapy? Dear Rebecca, we’re sorry to hear about your brother’s diagnosis. We recommend that you contact Novartis to find the hospital closest to you that offers this therapy. Thank you for your comment, and best wishes to you. Age 76. Diagnosed with ALL and treated with blina in a trial that failed in the last week.of a 28 week trail. Dear Don, we’re very sorry to hear about your diagnosis. The CAR T approval for ALL that has been approved by the FDA is available for patients ages 3 to 25. However, other CAR T therapies are available through clinical trials. If you are interested in participating in a trial at MSK. you can call 800-525-2225 or go to https://www.mskcc.org/experience/become-patient/appointment for more information on making an appointment. Thank you for your comment, and best wishes to you.